A supposedly haunted mirror has been sold on eBay for the princely sum of Â£100 (I have no idea if that includes P&P). The London-based pair selling the item claimed that it possessed strange powers, in particular the ability to cause intense pain, a constant feeling of being watched and a âsense of impending doomâ. Joseph Birch, a 20-year-old student and his flatmate, painter Sotiris Charalambous (34) put the mirror up for auction after finally having enough of the paranormal phenomena that apparently accompanied it. The sale had nothing at all to do with the fact that a student and his painter flatmate live in the enormously expensive centre of London and needed a little extra spending and/or food money. Probably. The mirror itself is actually quite nice, being described in the item listing as a âbeautiful Victorian style mirrorâ that enjoyed âpride of place in our North London studio apartment for several monthsâ. 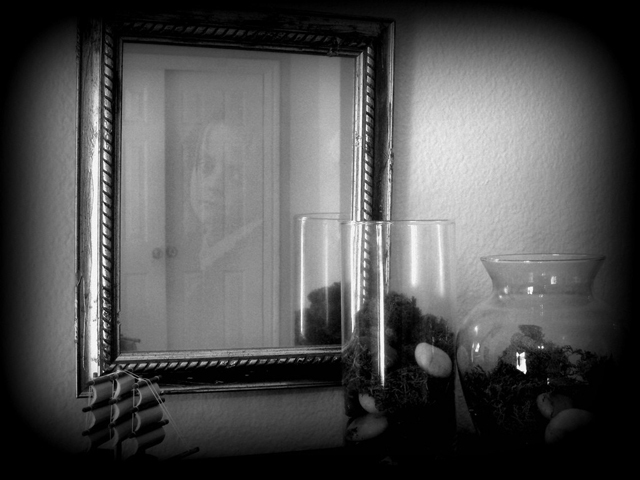 However, not long after putting the mirror up, the couple began to experience âstrange phenomenaâ. As if all that wasnât bad enough, the mirror is said to cause leg cramps, things going missing, bad luck, misery, financial problems, illness and the aforementioned sense of impending doom. As for screaming in the middle of the night â it might be a flashback from living in halls. You try sleeping when your neighbors are partying all night, every night and then setting off the building fire alarm every fourteen minutes â youâll scream too. Dunno about the leg cramps, though. That partâs a little spooky. Apparently, that includes paying well over the market value for an item in the hopes that it will cause them pain, financial problems and abject misery. Well, I think its safe to say, that by the time the âmagic mirrorâ arrives at its new home, the pair will have found a satisfied customer. …Unless the nasty mirror begins to reveal the image of a poor sucker with too much money, that is. Then, he/she might be somewhat disappointed, but as soon as the mood in the house turns sour â theyâll have gotten their moneyâs worth once again. Anyway, I digress, if youâre upset that you missed out on this âone of a kindâ item, head on over to eBay and type in the word âhauntedâ â youâll be surprised at some of the weird (and wonderful) stuff you can find. ← How Must Active Noise Cancelling Headphones Work?